HOP-ON! and in a single 2 hour loop, experience a complete City Tour — 3 centuries of history, architecture, and culture narrated live in English by your very own Tour Host – see the Garden District, French Quarter, and CBD. HOP-OFF! 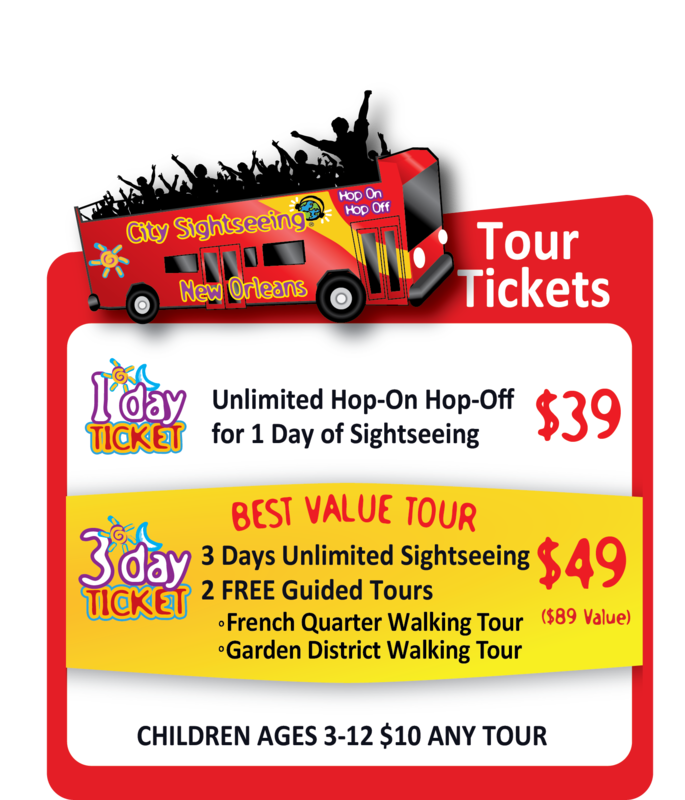 at any stop along the way and explore New Orleans most popular neighborhoods, attractions, and shopping districts – or – take advantage of our Guided Walking Tours in the French Quarter and Garden District, included Free with 3 Day Tickets. Enjoy unlimited hop-on hop-off privileges – Spend as much time as you desire at each stop! Experienced Tour Guides offer historic and interesting commentary and answer questions, One on Every Bus! Buses visit Each Stop, Every 30 Minutes! Stay as long as YOU like at each location. You can always catch the next bus! Continuous Loop tour so YOU can decide what time your tour begins and ends. Tour Loop is 2 hours; Hop-On by 3:30pm for a complete loop. 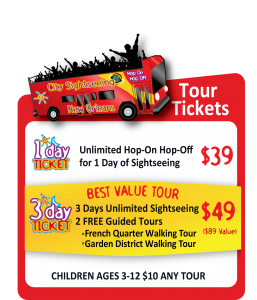 Hop-Off and present your ticket to receive deals and discounts at various attractions, restaurants, and gift shops all along the route! Explore the City of the Dead and visit the historic LAFAYETTE CEMETERY #1 at Stop 12 in the Garden District. Self-Guided Walking Tour Maps distributed on every bus.